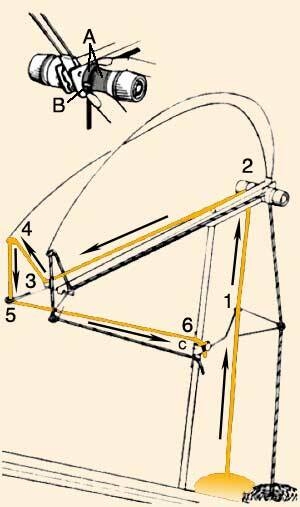 Always check that your knit carriage is set correctly and is ready to cast on. Make sure the change knob (4) is at N-L, the holding cam lever (5) is at N, none of the cam buttons (10) are selected and set the tension dial (3) at the appropriate tension for the yarn you are about to use. Always make sure the yarn is threaded through the tension unit properly and that the tension dial on the unit is set according to the thickness or ply of the yarn. To thread correctly follow the instructions below. Pass the yarn through the Rear Yarn Guide sliding the yarn through the eyelet. Pass the yarn under The Pin and between the two Discs from behind. Hold the yarn and pull it towards you so it goes under the Pin. Thread the Front Yarn Guide. Thread the yarn into the Eyelet of the Take-up Spring. Clip the yarn under the Yarn Clip. 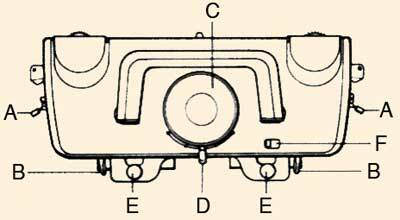 The cam lever (D) must be in the middle setting of the stitch dial (C) for cast on and normal knit. 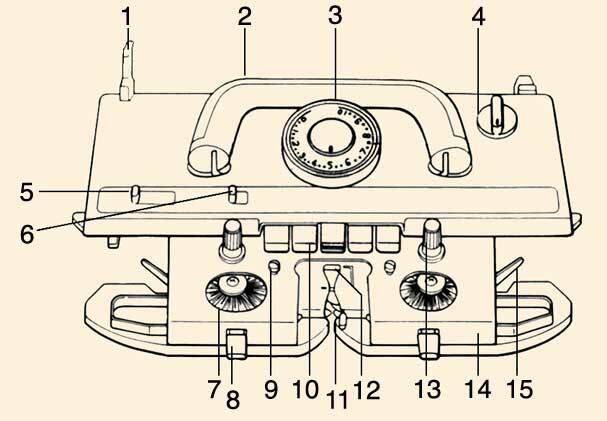 The side levers (A) must be in the upper position, the russel levers (B) at II, weaving and tuck knobs (J & H) at the circle settings and again the appropriate tension setting on the stitch dial for the yarn you are about to use. Again the yarn must be thread through the tension unit correctly to prevent the yarn from snapping. Follow the instructions below. Cast on over 50 needles with main yarn. Knit 8 rows. Change to contrast yarn, knit 8 rows, remove claw weights and bring needles slightly forwards. Double up this contrast stripe by hooking the last row of the main yarn back on to the needles. Re-hang weights and change to main yarn, knit 8 rows, change to contrast yarn, knit 8 rows, repeat hooking action. Repeat this as many times as required. Using a contrast yarn, knit 2 rows. Change to main yarn, knit 2 rows, and again repeat this until desired effect is obtained. Action 1- Starting from the 2nd needle on the left, transfer every alternate stitch to the needle on the right; make sure all needles are in work position, knit 4 rows. Action 2- This time starting from the 3rd needle on the left, again transfer every alternate stitch to the needle on the right, knit 2 rows. Repeat actions 1 & 2 to form a simple lace pattern. Transfer the centre stitch to the left, knit 2 rows. Transfer the stitch to the left and the stitch to the right of the centre hole, knit 2 rows. Continue to transfer the left and right stitches in relation to the last stitches transferred over next 8 rows. This should produce a chevron of holes.. Using two 2-prong transfer tools, cable 2 over 2 either side of the zero, then work 2 more cables each side of the centre, leaving 2 needles between each, making 5 cables altogether. Knit 4 rows. Repeat this same action as many times as required. Using the 3-prong transfer tool Dec 1 st. at each end, remembering to put the empty needles into non-work position, knit 2 rows. Again using the 3-prong transfer tool Inc 1 st. at each end, knit 2 rows. 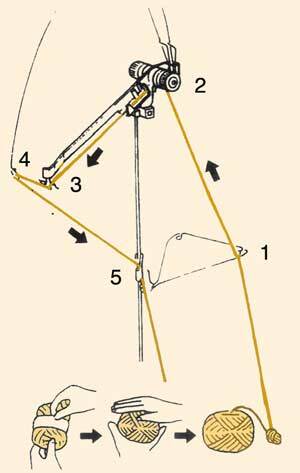 Pull the centre needle up to hold position, then 3 more to the left and to the right, every 4th needle to make 5 altogether on either side, set the K carriage at H (hold position), knit 3 rows. Change K carriage back to N (normal position), knit 1 row. Bring the centre needles between the previous tucks up to hold, K carriage on hold, knit 3 rows. Knit 1 row on normal position. Repeat till desired effect is completed.